Working the trails near the peak of Mt. Meron (Israel), I began to set goals. 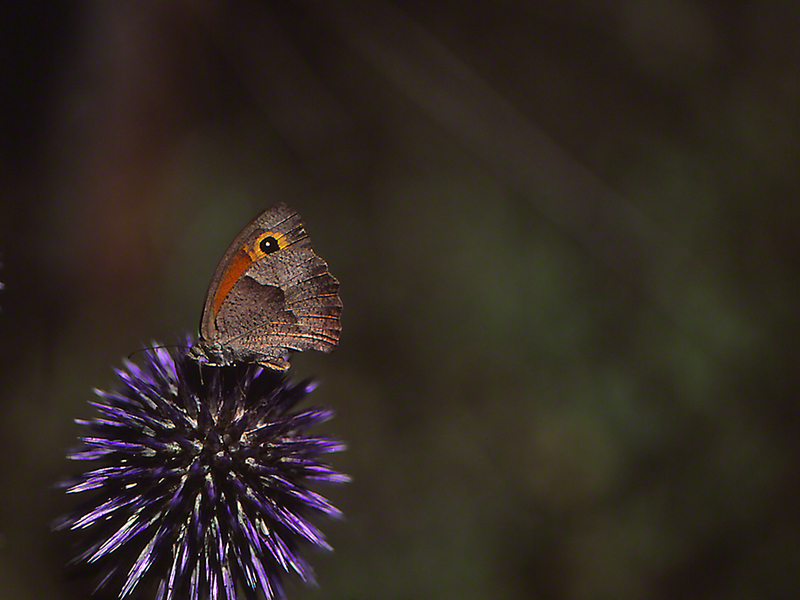 Turkish Meadow Brown butterflies (Maniola telmessia telmessia) were common enough, and almost all of them were fresh and quite ready for the camera lens. As you’ve read so often at wingedbeauty.com, here was another Israeli butterfly that was especially difficult to approach. Among the many wildflowers in bloom on those early June mornings and late afternoons, Common Globe-Thistle (Echinops adenocaulos) were strikingly noticeable, and other worldly looking. They were 100% cooperative, not moving one millionth of a centimeter that morning. At some minutes after 10 AM, Bingo! Now, I had to be especially careful, because the built-in light meter of my Canon camera has failed me, so I was on my own. You see that I found my imagined opportunity. She was sipping nectar, fully focused on the nectar being pumped by the Globe-thistle. Her large forewing “eyes,” look just as I saw them on the mountain, and their sweet yellow rims border an attractive field of orangish-brown. She was an excellent subject, working that flower cluster slowly and methodically. Like Mae West, she communicated, ‘You make no funny moves, and I’ll stick around too’! Unlike Mae, a bit of her left hindwing appears to have gotten too close to an overly interested fan.